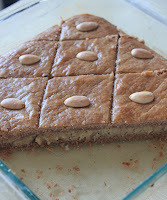 Now, I was so excited to be back in the Daring Bakers' Challenge this month, because I had never heard of Gevulde Speculaas before, but it sounded amazing! I immediately went to my kitchen to check on all of my spices. Making this pastry definitely forces you check your spices to ensure that they are actually good and have not been sitting in your cabinet for years! Once I knew all of my ingredients were good to go, I went to work right away! I followed Francijn's advice too and prepared all of the ingredients a day ahead of time so that the flavors could meld together. I highly recommend doing this if you decide to try this tasty new treat. Just as a note, although this recipe may seem complicated and appear to require a lot of work, it really does not! It was actually quite simple and enjoyable to make, so don't let the list of spices scare you away! Grind the almonds for one or two minutes in a food processor, until you see nothing but very small pieces. (Or skip this step if you use ground almonds.) Add the sugar, and grind for another one or two minutes. It must be very fine after this step. Add the egg and lemon zest until all ingredients are combined in the food processor. Store the almond paste in an airtight container in the refrigerator. Although the flavor gets better as days pass by, it is not wise to store the paste for too long, as it contains a raw egg. Put flour, baking powder, sugar, salt and spices in a bowl. Add in the diced butter and knead until smooth. Add a little milk if the dough is too dry, but only add a small amount, a little at a time. I only ended up needing 1 tablespoon of milk once the butter smoothed out and held the dough together. Wrap the dough tightly and put in the refrigerator for at least two hours or over night. Since I made the dough a day ahead of time, I stored it overnight so that the flavors could really meld. You can also freeze the dough. -Shallow baking pan, 8x10 square or round, or 8x8 (whichever you prefer for the size and design you want to cut your pieces). Preheat the oven to 350 degrees F and grease your baking pan. Then, divide your speculaas dough in half. Roll out one half of the dough on a lightly floured surface until it is about the size of your baking dish. Press the dough down into the baking dish until it covers the entire bottom of the dish. Then, taking a little bit of your egg wash, brush the wash over the dough in the pan. Next, take your almond paste and press it evenly over the dough in the pan. If you made the dough ahead of time, then you can use your hands to push down and spread out the paste. However, if you just made the paste, it should still be smooth and soft enough to spread out with a spoon or spatula. Using your egg wash again, brush another layer lightly over the almond paste. Then, take your second piece of dough, and just like the first piece, roll it out and place it down on top of the almond paste. 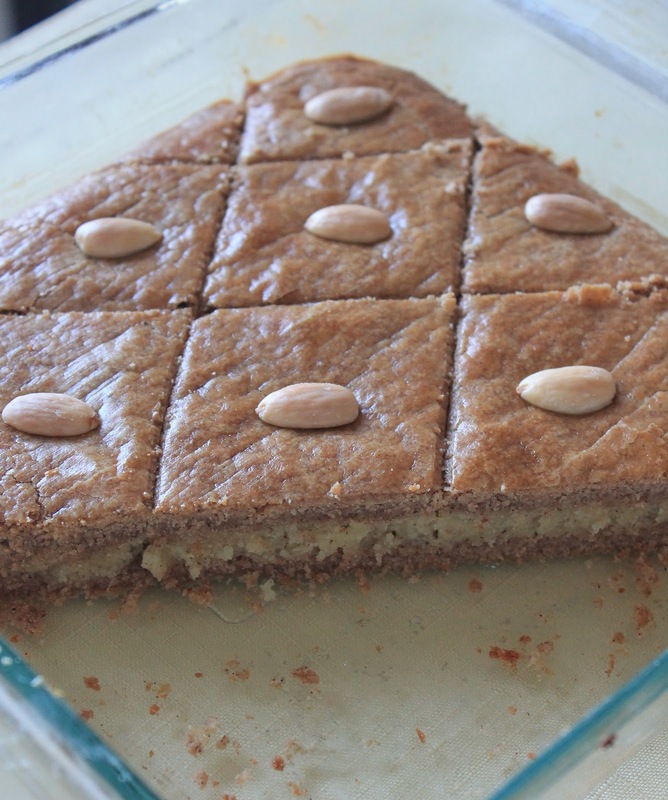 Brush the remaining egg wash on top of the dough, and decorate with almonds as you desire. Bake the pastry in the preheated oven for 40 minutes. Once done, let the pastry cool completely in the baking dish before serving. Cut the pieces up as you wish and enjoy! This pastry truly was so delicious and made my kitchen smell so wonderful! 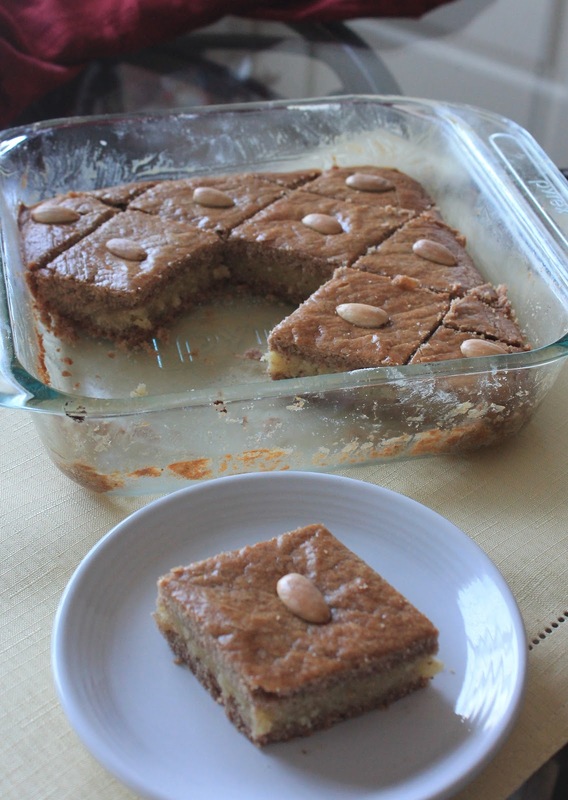 I actually really enjoyed having this with a cup of coffee and it reminded me a lot of an almond coffee cake. Thank you again to Francijn for having us make this traditional Dutch pastry. It will surely be making an appearance in my kitchen again! Your squares are beautiful, almost like a quilt top! Nice job on the challenge! Wow these look incredible, I am definitely going to have to try. Thanks for sharing! I am so excited to find your recipe! Others did not sound like what I remembered from 49 years ago, and this one does. 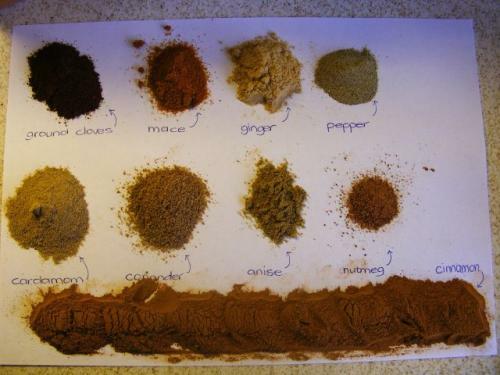 I even have time to get all the spices and ingredients ready before Christmas. Ummm...I can already imagine the fragrance and delectable taste! Thank you.